The GainMaker® Broadband Amplifier Platform includes a variety of RF amplifiers that address the divergent needs of today’s broadband networks. All GainMaker amplifiers provide superior 2-way performance and reliability combined with a user-friendly layout. All share common plug-in accessories and perform to 1 GHz in the forward path. The System Amplifiers in this family provide multiple forward RF output ports while the Line Extenders provide a single forward RF output port. The GainMaker® Broadband Amplifier Platform includes a variety of RF amplifiers that address the divergent needs of today’s broadband networks. All GainMaker amplifiers provide superior 2-way performance and reliability combined with a user-friendly layout. 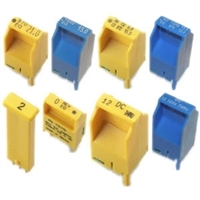 All share common plug-in accessories and perform to 1 GHz in the forward path. The System Amplifiers in this family provide multiple forward RF output ports while the Line Extenders provide a single forward RF output port. The GainMaker® Broadband Amplifier Platform includes a variety of RF amplifiers that address the divergent needs of today’s broadband networks. All GainMaker amplifiers provide superior 2-way performance and reliability combined with a user-friendly layout. All share common plug-in accessories and perform to 1 GHz in the forward path. The Line Extenders in this family provide a single forward RF output port while the System Amplifiers provide multiple forward RF output ports. The GainMaker Line Extender modules have increased gain and are mechanically compatible with previous Line Extender II and III housing bases, often enabling upgrade to higher bandwidth with no re-spacing or re-splicing. The DC power supply is modular and located in an updated housing lid for easy access. All GainMaker Line Extender modules are factory configured with reverse amplifier, diplex filters, forward interstage pads and interstage equalizer, to ensure optimal performance. For output level control over temperature, optional configurations additionally include either single-pilot Automatic Gain Control (AGC) or a Thermal compensation circuit. The GainMaker Line Extender has a single forward RF output port and is ideally suited for providing high (bridger) level RF in the feeder network. The GainMaker® Broadband Amplifier Platform includes a variety of RF amplifiers that address the divergent needs of today’s broadband networks. All GainMaker amplifiers provide superior 2-way performance and reliability combined with a user-friendly layout. All share common plug-in accessories and now perform to 1 GHz in the forward path. The System Amplifiers in this family provide multiple forward RF output ports while the Line Extenders provide a single forward RF output port. GainMaker System Amplifiers utilize GaAsFET technology in the interstage and output gain stages for improved distortion performance. The GainMaker System Amplifier modules have increased gain and are mechanically compatible with previous System Amplifier II, II+, and III housing bases, often enabling upgrade to higher bandwidth with no re -spacing or re-splicing. The DC power supply is modular and located in an updated housing lid for easy access. All GainMaker System Amplifier modules are factory configured with reverse amplifier, diplex filters, thermal compensation circuit, forward interstage pads, and equalizer to ensure optimal performance. Optional single-pilot Automatic Gain Control (AGC) configurations are also available. The GainMaker High Gain Dual (HGD) System Amplifier is ideally suited for providing high (bridger) level RF to the feeder network. It provides two forward RF outputs (Main and Auxiliary), with the option to create a third RF output via use of an optional plug-in Auxiliary path signal director. 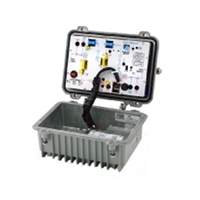 The GainMaker amplifier accessories are plug-in devices common to all GainMaker System Amplifiers and Line Extenders. They are typically field installed in accordance with system design.